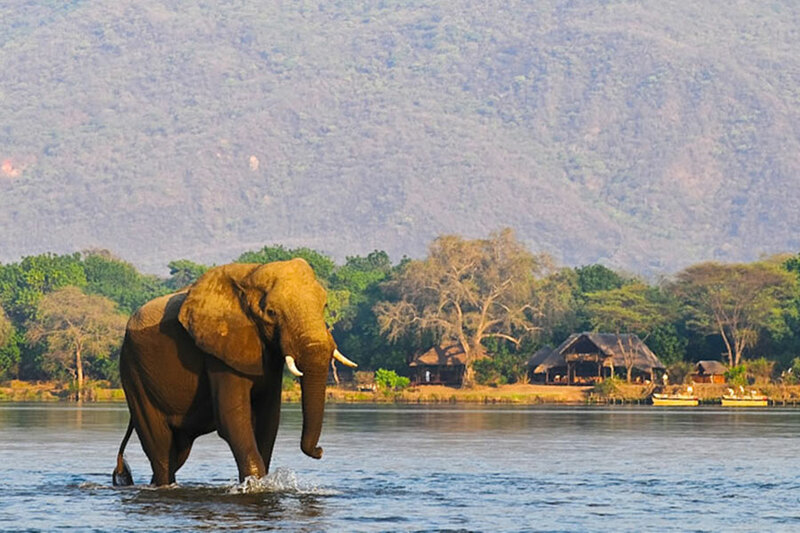 These two iconic camps are situated on the Lower Zambezi River in the Lower Zambezi National Park which is renowned for stunning scenery and excellent wildlife opportunities. Both camps offer superb guiding, a whole variety of exciting activities including hides sits, walks, game drives and boat activities. Pay for 3 nights. Get the 4th one free – Valid 24 April – 15 May + 17 Oct – 21 November. The free night does not include the $ 90 per person per day conservation fee. Pay for 4 nights. Get 5th night free – Valid 24 April – 21 Nov. The free night does not include the $ 90 per person per day conservation fee. 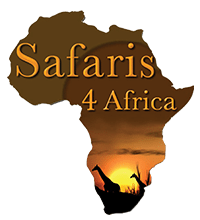 Contact Us so we can arrange this memorable safari incorporating these special packages. 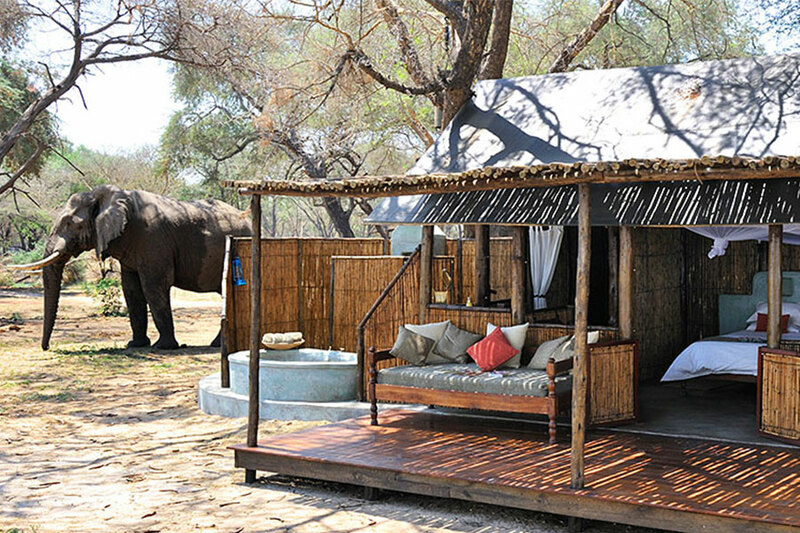 Chiawa Camp blends in effortlessly with its idyllic surroundings, and provides a retreat which guests are invited to make their home away from home. 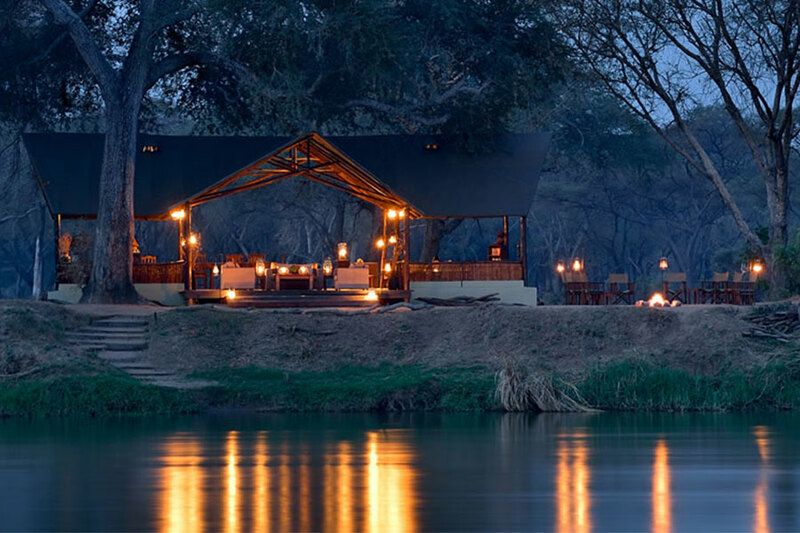 Situated on the banks of the Zambezi River, under a grove of evergreen Mahogany trees, Chiawa Camp holds the prime position in the heart of Zambia’s Lower Zambezi National Park. A stunning thatched lounge/bar area with upstairs viewing deck provides one of the best views of the Zambezi River, and a fantastic setting to watch the sun set over another day in Africa. After enjoying Chiawa’s renowned cuisine on the al-fresco dining veranda, one can relax by the open camp fire with a cocktail in-hand, reminiscing upon the day’s adventures before retiring for the night. 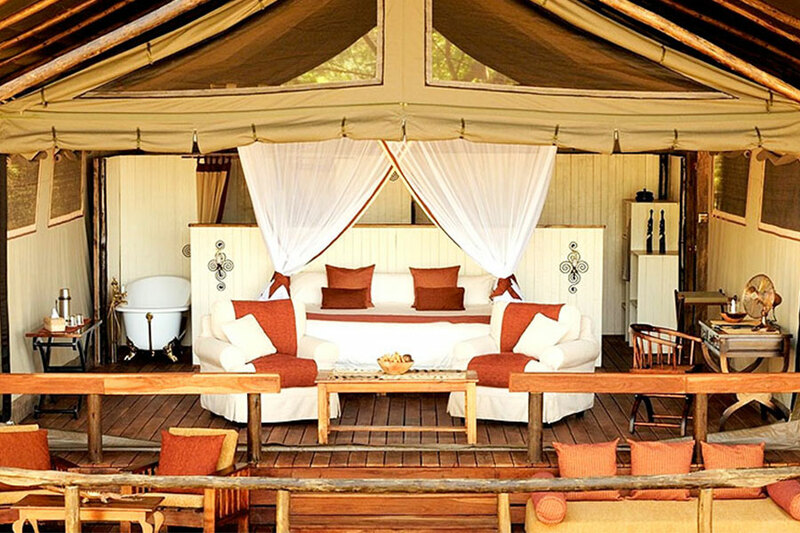 Each of the tents are a sanctuary of luxury and tranquility. Also available for guests’ enjoyment and relaxation are two perfectly positioned game viewing hides and a gorgeous swimming pool with timber sun deck overlooking the Zambezi. For the more active, a small but well equipped, secluded Exercise Area with a splendid view of the Zambezi is available for guests who might wish to work off some calories or keep up their fitness levels. We believe these tents set the standard for luxury Lower Zambezi National Park accommodation; however they still retain the rustic and unpretentious feel that Chiawa is so well-loved for. Tents VII, VIII & IX all overlook the dry riverbed with quartering views of the Zambezi River whereas Tents I – VI face the Zambezi directly. Overlooking a maze of hippo-inhabited islands, and a grove of Acacia trees from which massive elephant bulls constantly feed, this is perhaps the most beautiful site in the Lower Zambezi National Park, and certainly one of the most remote. For those wanting a premier Lower Zambezi safari in a small camp with all the comforts and a fabulous guiding team, inside the national park and at an attractive price look no further than Old Mondoro. Appropriately constructed of canvas and natural materials, Old Mondoro has an open and adventurous feel, providing a perfect retreat after a day filled with excitement in the bush. At night canvas blinds are rolled down and secured although with the night chorus you are assured of never feeling too cosseted or cut off from the action! Each room also has a shaded timber sun deck complete with comfy daybed for relaxation with the very best of views.